As Huffington Post blogger Jon Jachimowicz explains, being busy is seen as a form of elite status. Popular perception sees successful workers as eternally sitting behind a desk and pulling late hours. However, according to Inc., the number of studies finding that “busy” status equates with success in business is zero. In other words, workaholics do not achieve any greater success than their more relaxed counterparts, and they suffer far greater incidences of burnout. 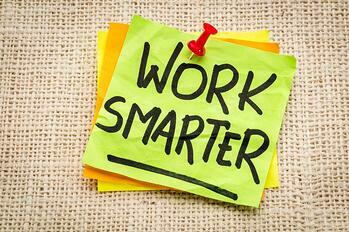 There is an easy solution to avoid overwork: work smarter, not harder. This philosophy relies on employees to maximize efficiency by prioritizing better. Organization and scheduling are key; deploying these areas more effectively can help relieve your stress while allowing you to accomplish more than ever. Think multitasking makes workers more productive? Think again. According to a study by Stanford neuroscientists, multitasking actually lowers work quality and output by reducing memory, retention, and concentration. Instead of working on everything at once, limit yourself to one task at a time, and completely finish it before moving on to the next task. There are plenty of apps and programs that can help you increase your focus, so look for one that works best for you. The calendar is a worker’s best friend, helping maintain focus, lay out goals, and keep meetings in order. However, carving out the time to get your calendar in order can be a challenge. As odd as it might sound, Mind Tools suggests the best way to keep your calendar in order is scheduling time for scheduling. Simply pick a date and time each week (or month, depending on your workflow) to write out everything that needs to be done and when. Be sure to also add contingency time to relax or to fit in unexpected items. This “padded” time can additionally serve to return phone calls or respond to emails at a specific interval each day instead of reacting to them as they come. In a typical office, CNN Money notes about an hour is wasted everyday due to disorganization. To avoid losing five hours a week on a messy desk, commit to keeping a clean and efficient workplace that keeps similar office supplies together, cuts down on personal knickknacks, and has a designated and visible space to display the to-do list. In addition, Greg McKeon, author of Essentialism: The Disciplined Pursuit of Less, suggests organizing your computer clutter as you would your desktop. Having tons of tabs open and running can create a sense of chaos and prevent you from focusing on the task at hand. As you write out your day’s schedule, consider sorting tasks by due date, time commitment, similarity, or task needs. Stephen Covey in The 7 Habits of Highly Effective People advises sitting down daily before the work begins to label your tasks into one of four work flow quadrants: I. urgent and important, II. urgent and not important, III. not urgent and important, and IV. not urgent and not important. Work your way through the quadrants until the first three boxes are complete. When there is nothing in the top three, you can work on the busy-work priorities in quadrant IV. To weed out those time wasters, take out a piece of paper and track each of your tasks and how long you spend on them. You may be surprised to see that those “two-second” emails to clients actually are taking you half an hour. Once you have a clear picture of your day, you can look for solutions that will eliminate time waste or allow you to delegate smaller tasks to others. Accomplishing more in the workplace should not require you to spend more time at your desk. As a business professional, it is important to implement systems that allow you to put your passion to work without overworking. By eliminating multitasking and over scheduling while concentrating on organization and time tracking, you can be more efficient at work and ultimately be a smarter worker.